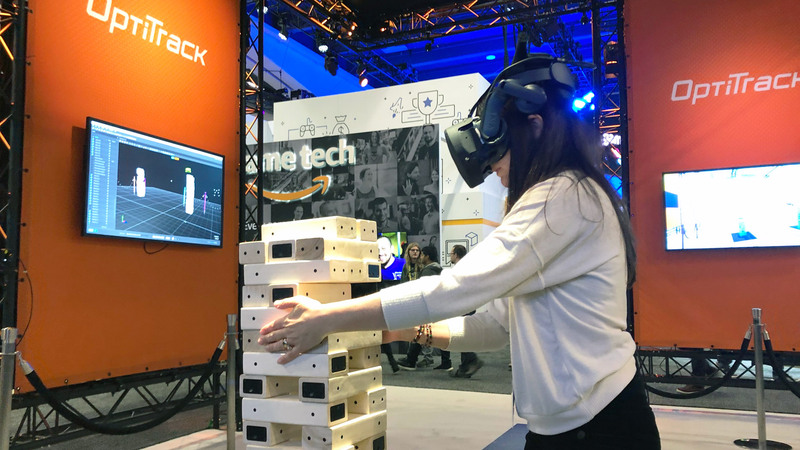 At the company’s GDC booth last week, OptiTrack had one of their modular tracking volumes set up with 25 cameras tracking 140 real-world objects simultaneously. Most of the objects were custom-made giant Jenga blocks which were (each individually tracked), along with VR headsets, gloves, and more. To demonstrate the tracking performance, the OptiTrack team also set up the blocks as dominoes to knock them down. 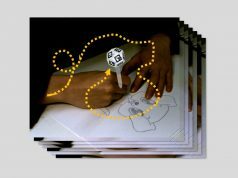 While it looks outwardly like a physical simulation rendered in the computer, there’s actually no physics calculations happening at all, just raw motion tracking information of how the blocks are individually moving in the real world. 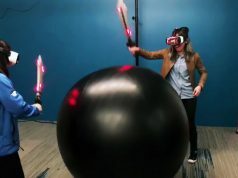 With the ability to track hundreds of objects at once, in a VR context one might imagine an entire ‘set’ of props in a single room—chairs, desks, balls, guns, swords, and other objects—all of which could be tracked in addition to multiple users in VR headsets which could cooperatively use the objects as part of an entertainment experience. OptiTrack says they haven’t found a practical limit on the number of tracked objects their system can support, even after experimenting with more than 300 at a time. In the last few years OptiTrack has been building out its software and hardware to support out of home XR applications. 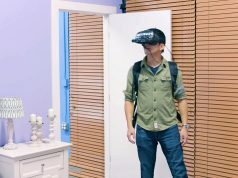 The company now sells ‘snap-on’ faceplates for both the Rift and Vive, which augment the headsets with the markers needed for large-scale OptiTrack tracking, as well as ‘pucks’ (self-contained trackers for attaching to arbitrary objects), and an ‘active tag’ which can be used to create custom-made tracked objects (like the Jenga blocks shown at GDC). OptiTrack also says they’ve built an OpenVR plugin which allows their tracking to transparently replace SteamVR Tracking, enabling compatibility between OptiTrack tracking and SteamVR content which is useful for developers building out of home VR content for Vive headsets. A minimum of three OptiTrack cameras are required for tracking, the company says, with arbitrary numbers of additional cameras able to be added for larger tracking volumes and robustness against occlusion. While the hardware is no doubt expensive (with single cameras starting at $1,500), the company’s tracking platform is becoming an increasingly comprehensive and scalable solution for large-scale, high precision XR tracking. That’s actually really cool! I missed this one! Thanks! Somebody needs to make a reasonably prices set of controllers and HMD tracker to upgrade the WMR systems. I know the Odyssey would be a great alternative to the Vive Pro with better controllers. Now Make It 100 Times Cheaper!!! I recently did a VR experience that was using OptiTrack and the tracking was abysmal. Major drift and jumps that made some of the group physically sick. That said, the demos look impressive so I have to wonder why this experience was so bad.